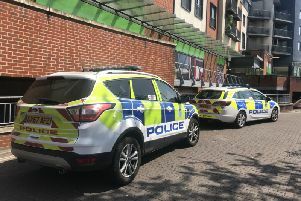 Crawley Police launched an operation last week (commencing October 17) as part of the ongoing Operation Enforcer which involved a number of warrants being executed at various addresses, according to Sussex police. Sussex police confirmed Operation Treasure resulted in 20 arrests for various offences including drug possession and burglary. A statement from Sussex police said: “Two people have been charged with three counts of class A drug possession with intent to supply. “Both Angelique De Costa, 19, unemployed, of no fixed address and Mohammed Hussain, 21, a student of Shaw Square, London appeared before Crawley magistrates on Thursday, 20 October. They were bailed to appear before Lewes Crown Court on 17 November. Inspector Sue Neilson said: “Once again we are sending a clear message that drug related crime will not be tolerated in our town. “These latest arrests come from valuable information provided by members of the public. Police have appealed to witnesses or anyone with information to email 101@sussex.pnn.police.uk or call 101 quoting Operation Treasure.